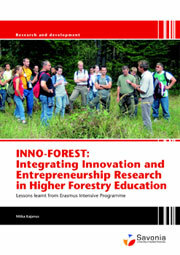 One hundred students and one hundred enterprises from thirteen countries took part in the INNO-FOREST-project during 2005 in Iisalmi, Finland, 2006 in Zvolen, Slovakia and 2007 in Sopron, Hungary. The main objective of the project was develop methods and tools for knowledge transfer among research, education and enterprises. Innovation is not mainly a linear process from science to paractice; instead it is a complex phenomenon necessitating interactions among research, education, enterprises and their customers. This challenges in particular higher education to develop new models. The INNO-FOREST-project is an example in this development.